Sorry for the stupid question, but I figured you experts would know: is the bracelet on a Mark II integrated? Or can it be removed and replaced with a strap. I have been looking at vintage El Primeros on straps, but love the racing-style dials on the Mark II, but would prefer to have the strap look with it. Before I buy, I figured I'd ask. The "hooded" lugs cover up a traditional springbar that can be removed just as easily from the back side as a case with regular lugs. 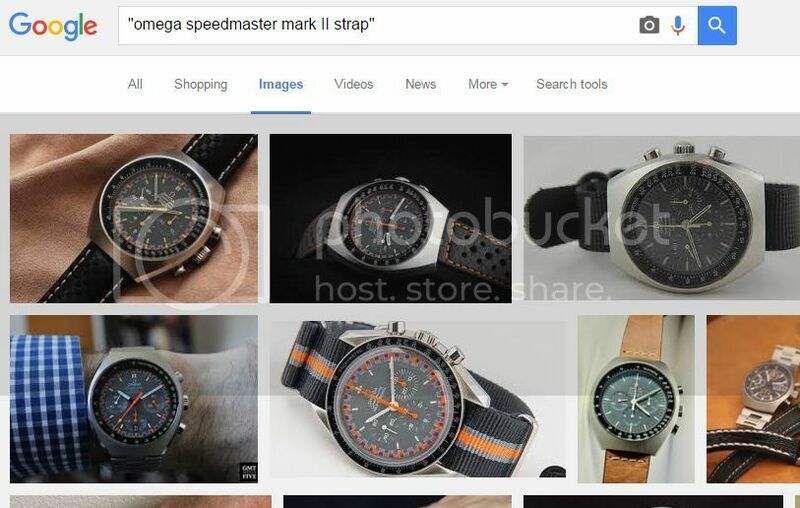 You can Google Image "omega speedmaster mark II strap" and see a bunch. Have fun chasing one down and and enjoying straps...and please come back and share pics. I saw some of those pictures, but couldn't tell if they were old or "new vintage" versions of the Mark II. I haven't ever seen one in person, and of course I don't want to get something with integrated strap. The moon case one is the Japanese limited edition racing dial, right? That one I like well, along with TinTin. It's nice. Note that the dial is considerably grayer than the Moonwatch, which doesn't always come through in pics. You might want to go to an Authorized Dealer or an Omega Boutique and hold the Mark II re-issue and a Moonwatch next to each other to make sure you're happy with the overall proportions. The dial is smaller on on Mark II and hands are shorter than Mooncase based models which have hands that are like loooooong legs. Next Topic: "Houston... Everything is A-OK."